Human milk oligosaccharides (HMOs) are the third most abundant solid ingredient in breast milk. These sugars – unique to human milk – protect newborns from disease and infection, establish healthy gut bacteria, and are essential for infant brain, intestinal, and immune system development. 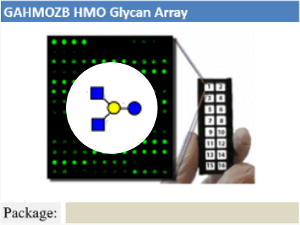 The HMO Glycan Microarray is designed to make the investigation of HMOs easy and efficient. 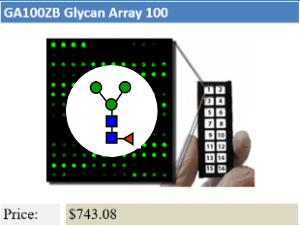 As leaders in the glycan microarray industry we have developed sensitive, high density arrays for the research of glycan-binding proteins and antibodies. 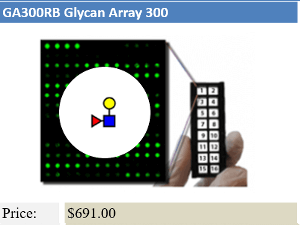 Using minimal sample volume and only a few hours, these arrays can be tested with cells, antibodies, or other proteins to determine which HMOs interact and give insight into the functions of these HMOs and their binding partners. 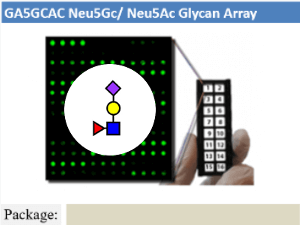 Example: HMO Glycan Microarray on 8 subarray format. A subarray assayed with biotinylated AAL lectin (10 μg/ml), followed by streptavidin-Cy3 (1 μg/ml). The array was scanned with GenePix scanner at 450 PMT and 100% laser power at 532nm wavelength. The positive control shows binding as expected. All HMOs containing fucose show fluorescent binding signal.